Vacation! I love them but I know I’ll be bad! There is a scrumptious bakery close by and I know we will be visiting nearly every day! I’ll make sure I work out though. Last weigh in the other day was 147.6 I think. It’s Raw week over at the “I Heart Cooking Clubs” web site. Raw? Hmm, what kind of inventive dish could I make that’s raw? 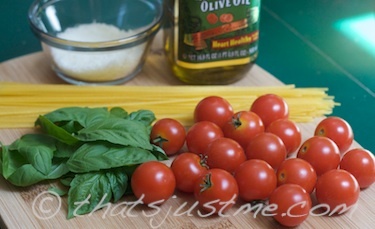 I launched the Mark Bittman “How To Cook Everything” iPhone app and searched for “raw” – the first recipe that popped up was “Linguine with Raw Tomato Sauce” – oh that sounded good. I was hungry for lunch this afternoon, so I decided to make one serving for me. The ingredients and cooking steps are so simple, it’s laughable! I bought a box of fresh local apricots the other day and I wanted to use them up, along with one overly-ripe lonely banana. Wouldn’t a nice loaf of whole wheat sweet bread would do the trick! So, I googled, and would you believe most of the apricot/banana bread recipes use “dried” apricots. 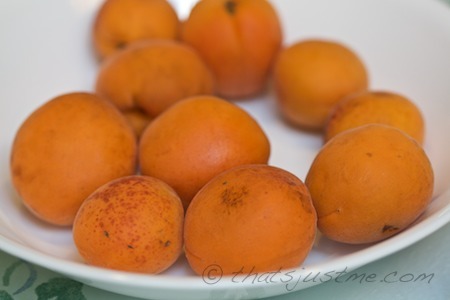 These were yummy FRESH apricots. Then, I thought, wait, apricots are just like peaches, so why not find a nice peach bread recipe and modify it with apricots instead. I found what looked like a good ginger peach bread recipe over at honestfare.com – yummy, never thought of adding ginger. Great idea! So, this recipe is inspired partly by Honest Fare and partly by my other two sweet bread recipes. Of course, it’s made with whole wheat flour, and it’s got less refined sugar and more fiber than most sweet breads. 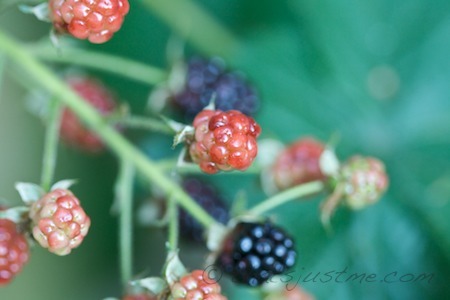 I was curious to figure out if our backyard bush was indeed a blackberry or perhaps instead, a black raspberry bush. After some research online (isn’t google grand? ), I am now fairly confident that we have a BLACKBERRY bush, not raspberry. The big difference is the way the stem affects the berry. 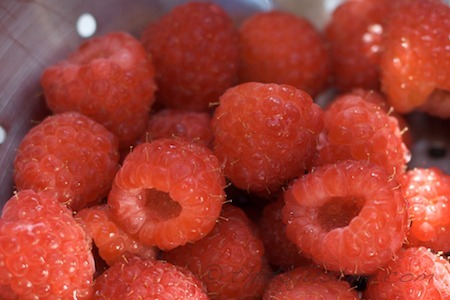 A raspberry has a hollow opening when picked, the blackberry does not. 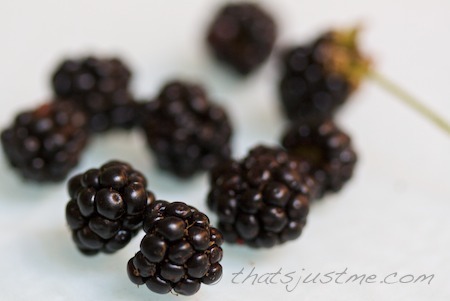 And here is a photo of a few of the blackberries picked a few days ago from the backyard bush. 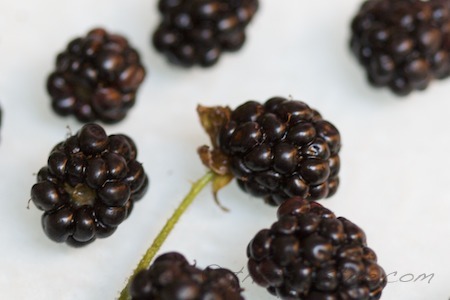 The blackberry has a white core from the stem. I found this web page on wikihow that explains it very well, with photos too. I don’t know why I never noticed these berries before this season. We’ve been living in our home for a couple of summers, but for some reason, I never really paid attention! Anyway, a few weeks ago, I saw a few branches of green berries. I tried googling, but couldn’t decipher if they were unripened blackberries. I wasn’t sure when the season began for berries in New England; I assumed they should have been ripened by now, so I figured they were inedible. But suddenly, yay, I noticed some of the berries were turning red, then a dark blue/black. I picked a couple and brought them inside. After carefully and gently washing them, I bravely took a bite. A little bit sour, but they were edible. I have picked three batches so far, picking every 2-3 days! 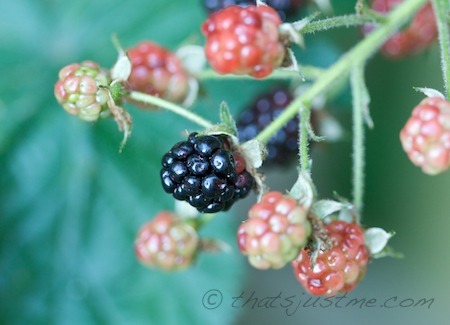 It’s exciting to be able to gather fresh blackberries from my own backyard! Last time, I mixed them with sweet blueberries from the CSA farm, and yum! I love eating healthy. This has been the most food adventurous summer I have ever had! I have found such an appreciation for so many different seasonal foods. Summer is definitely my favorite season, but it’s going to be fun to come into autumn’s veggies too. It’s just so exciting! I am so inspired! 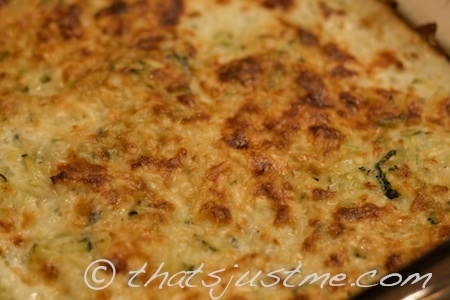 I received some lovely zucchini in this week’s CSA share, and I wanted to make some more of the yummy zucchini onion pancakes, but didn’t have the time to sit and cook pancakes tonight. I needed something that could be thrown into the oven and easily baked with virtually no assistance. So, hmm, I thought, how about a baked gratin? yum. 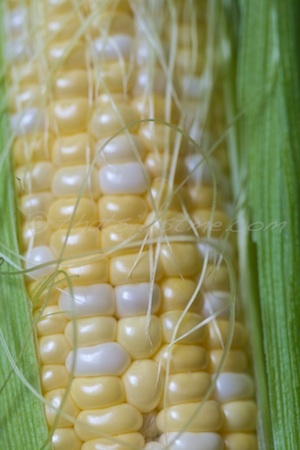 We got 3 ears of fresh sweet corn on the cob in the CSA share this week. My DH was going out for the evening, and I was hungry. I couldn’t waste time cooking the corn, so I ate all three raw, as a late afternoon snack. Oh it was fabulous. Brought me back to my childhood at our summer house. 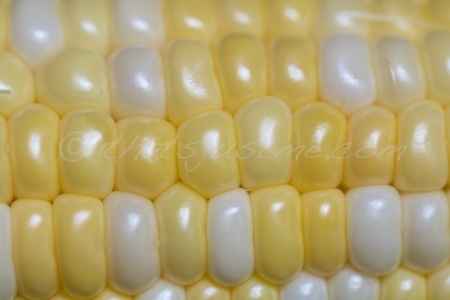 My mom used to buy fresh corn at the farm and we used to eat an ear or two raw. Yum, I just love corn. I don’t believe the nah-sayers that say it’s not good for you!